Sucrier is a great choice for families. Mothers with young children, every bedroom is interior access only, and the master suite is the only bedroom upstairs. The pool is well-sized for rambunctious kids and teens, and the villa is a short walk from the beach and restaurants. Sucrier Villa is a three bedroom home overlooking a bluff on Baie Longue. 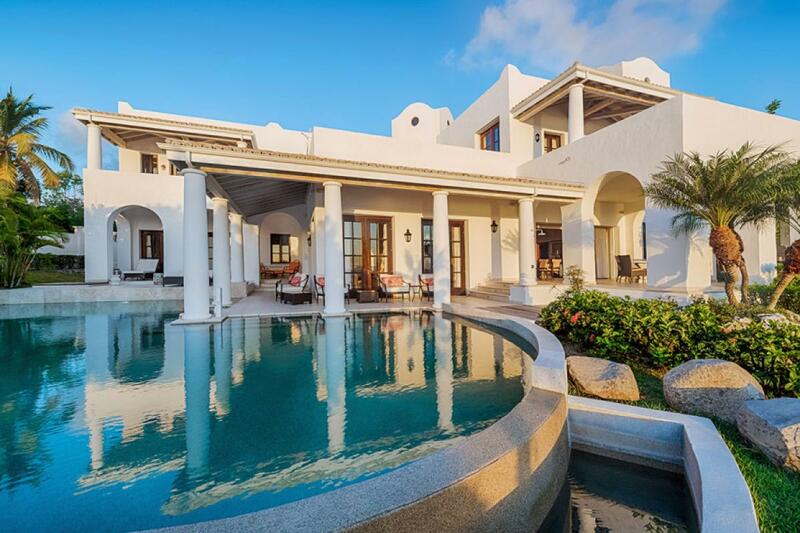 This villa is part of La Samanna Resort, which offers guests amenities like tennis courts, a spa, boutiques, and fine dining. Sucrier has a wraparound overflow pool surrounded by tropical gardens. Loungers sit on the outside of the deck, and two dining tables give guests substantial space to enjoy al fresco meals. This area opens up to the indoor dining and cooking space. The fully equipped kitchen sits adjacent to the sunken living area, which features natural lighting and open archways. The sunken living room sits adjacent to the kitchen, with a satellite TV, DVD player, iPod dock, and pool views. Each of the four bedrooms has exclusive interior access and features an ensuite bath, satellite TV, DVD player, and ceiling fan. The master suite upstairs has a private terrace and sitting area, with a study off to the side. Three of the bedrooms, including the master, have king-sized beds, and the fourth bedroom has a full bed. Sucrier Villa is a five minute walk from the beach and dining, with a perfect location for family adventures and excursions. This villa is safe for children, but also perfect for friends traveling together. Additional guest can be accomodated with Roll away beds which can be rented. Private butler upon request during high season at an hourly rate, minimum 2 hours required.